We are spoilt for choice with the many superb beaches close to us. The three nearest beaches, however, are Rospico beach (500m), Raguenez beach (2km) and Port Manech beach (2km). Rospico beach, which is 500m away from the back of the garden down a footpath, has gently sloping sands for easy entry into the sea, and has a beach bar/café/restaurant that is popular with walkers and beachgoers alike. Raguenez beach, also known as ‘Tahiti Plage’ is a golden stretch of sand with plenty of space for holidaymakers to relax. This beach can be accessed via the coastal path (approximately 25 minutes’ walk from the house), or by road, and there is a restaurant ‘gastronomique’ within walking distance of the beach. Port Manech is a charming seaside village (that has a mini-market and bar) situated at the end of the Aven river estuary. It has an almost British feel with its colourful beach huts and has a popular watersports centre. 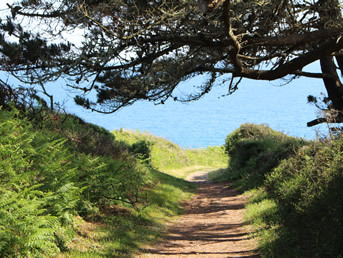 The beach can also be accessed via the coastal path (approximately 35 minutes’ walk from the house) or by road. There is also a lovely, reasonably priced restaurant set back from the beach where you can enjoy a drink or a bite to eat whilst appreciating the gorgeous vista out to sea. 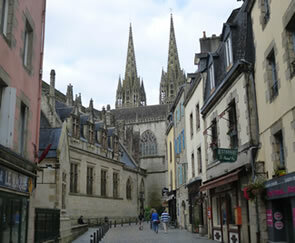 There is nothing better than a visit to the weekly Friday market at Concarneau, next to the historic walled town, to take in the wonderful atmosphere and diverse produce for sale, from ultra-fresh seafood to freshly cooked roast chicken and pork with crackling; there is also a daily indoor market here (Les Halles) offering wonderful goods. There is also a generous offering of supermarkets locally, the nearest being a five-minute drive away at our local town of Nevez (Intermarche), that also has a petrol station. Nevez also boasts, in our opinion, the best wet fishmongers in the area, who will also provide a luxury local seafood platter given advance notice. There are also a variety of bars, restaurants, a chemist, several bakeries, doctors and a dental surgery in Nevez. There are also supermarkets at Tregunc (Huit à Huit, Hyper Casino and Lidl, all 10 minutes by car), Rosporden (Super U, Aldi, Lidl, about 20 minutes by car). Concarneau, apart from its lovely weekly market, is home to many larger Hypermarkets and has a fantastic wet fishmongers, next to the fishing port itself. We are extremely fortunate to have many good restaurants locally, from Michelin-starred cuisine to eateries selling more modestly-priced fayre, that is just as delicious! The weekday set lunch menu is still very much a popular choice, and we can provide you with several recommendations to suit all tastes and pockets. Being keen walkers ourselves, and having already explored the glorious surrounding countryside and coastal areas around us, we are able to recommend many different walking routes enabling you to unlock the treasures of our local area. Routes can be planned according to length and difficulty, and can encompass the many pretty local towns and villages, incorporating a relaxing pause on a lovely beach and even a delicious lunch. We can also provide maps for guests’ use. Cycling is a hugely popular pastime in France, and this particular region is perfect for it, ranging from a mixture of gently undulating country roads peppered with enticing glimpses of the sea to the more challenging ‘Tour de France’ type of route. Should you wish to bring your own bikes we have plenty of secure storage in our garage; there is also a bike rental shop about five minutes drive away at Port Manech, which is very useful when wanting to explore the lovely quiet coastal lanes around Rospico or when visiting the local town, Nevez, a few minutes away, to buy some exquisitely fresh fish from the fishmongers or a croissant perhaps from one of the three bakeries. The local coastline offers a wonderful variety of watersports, to include surfing, paddle boarding, windsurfing, canoeing, with our nearest watersports centre being based at Port Manech, around 2kms away. There are many opportunities for equipment hire and courses. A stone’s throw away is Rospico Ranch, which offers horse-riding to people of all abilities. Just along the road from the house is the Rospico Botanical Gardens, home to many exotic varieties of plants. The Rospico Botanical Gardens is also host to many a jazz concert during the summer months, which is usually an entertaining and lively experience! There is a covered hall in case of inclement weather with drinks and snacks available to buy on site.